24 foot heaviest duty Lighting Tower. 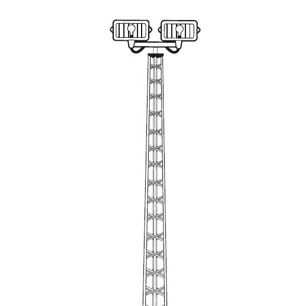 Wade's LT-4-24N 24 foot heaviest duty Lighting Tower is packaged complete with (3) 8' tower sections, CBS-06 concrete base stubs, a top and rotor plate with model 244A mast clamps installed, and our special nuts, bolts and washers. Wade's Lighting Towers are ideal for parks and recreational areas, farms, industry, parking lots, and many other applications.